Mansfield Town extended their unbeaten run to three matches after earning a 1-1 draw at Cambridge United and move into the top seven. Adam Chapman’s first goal since returning to the club in May was cancelled out by a heavily-deflected Ryan Donaldson effort in the first half. Mansfield twice came close to winning the match late on, but a second straight draw keeps the club in the hunt for a spot in the play-offs. 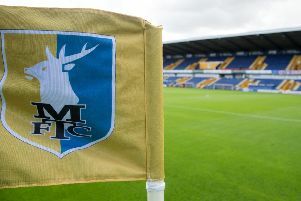 The Stags began the match in seventh place, four points ahead of the hosts, and they started brightly with top scorer Matt Green – on seven goals this term – heading Matt Blair’s right-wing cross over the bar. And they were rewarded on 23 minutes when Chapman’s 35-yard free-kick caught Sam Beasant wrong-footed at his near post with the goalkeeper only able to turn the ball into the net. Cambridge’s in-form player Luke Berry then had a goal ruled out for offside, but the equaliser came on 36 minutes through substitute Donaldson after his 20-yard shot took a heavy deflection and left goalkeeper Brian Jensen with no chance. And it could have been worse for the visitors heading into the break, but Jensen turned Ben Williamson’s shot wide from a narrow angle and Barry Corr stabbed wide. Mansfield regrouped at half-time and were far more solid in a second half where goalmouth action was at a premium. As both prodded and probed to little effect, Cambridge’s Leon Legge headed wide and Luke Berry volleyed over. But Mansfield nearly stole it late on as Green had an effort saved by Beasant, before Krystian Pearce found space from a corner only to see the goalkeeper make an excellent low save. Cambridge: Beasant, Gayle (Donaldson 19’), Legge, Roberts, Taylor, Berry, Newton, Ledson, Dunk, Corr, Williamson. Substitutes: Dunn, Slew, Kennedy, Coulson, Simpson, L Hughes. Mansfield: Jensen, Collins, Tafazolli, Pearce, Adams, Rose, Blair (N Thomas 66’), Chapman, Clements, Lambe (Yussuf 89’), Green. Substitutes: Shearer, Beardsley, Westcarr, J Thomas, McGuire.